We regularly undertake dent and paint repairs to the bumpers and bodywork of motorhomes, camper vans, horse boxes and caravans. Often we are able to fill and match where to replace parts would be far more expensive. With the experience and skills that Stottercliffe Garage possess in plastic welding and paintwork refinishing, you would never know there had been a bump. 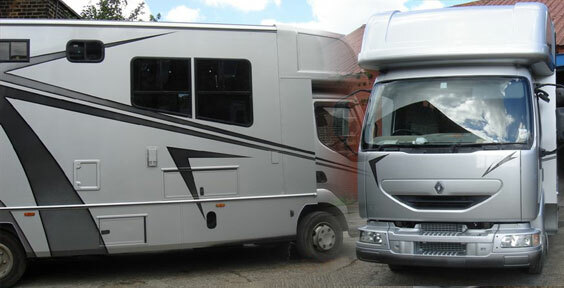 Aluminium repairs, fiberglass repairs and resprays for small, medium or large motorhomes. Styling options for Camper Vans and Motor Homes include nudge bars, A Bars, Side bars, Body kits, Alloy Wheels, Euroliner wheel trims, Walnut dash kits, etc. In our large and well equipped workshop, all vans, horse trailers and motorhomes can be catered for.